For Andrew Weatherly, art is a tool for personal and social growth. His work invites the viewers in for closer inspection. 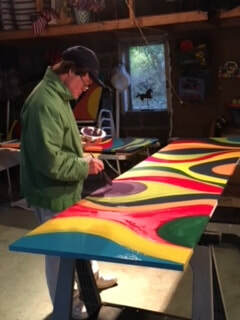 Weatherly, born with Down Syndrome, maintains that artwork is a tool he uses to advocate for people with disabilities. ​Painter, poet and photographer, the artist chooses media that offer him the extraordinary avenues for self - expressi﻿on, as well as, the ability to navigate compelling barriers while sharing his own insight and perspective with the viewers.
. 2014 V.S.A. International,The Journey, The Kennedy Center & Volkswagen of America Group, Emerging Young Artists, The Smithsonian Institution, Washington, D.C.
. A Room of Golden Shells, Woodbine House, Inc.
AndrewArtist_83115_10AM from Mike Karas on Vimeo. 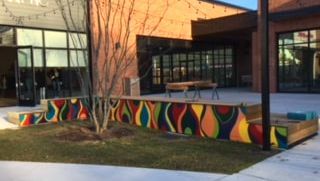 Andrew Weatherly's "Pizzazz" was installed in the newly renovated Closter Plaza, Vervalen Street, Closter, New Jersey. This is an Edens shopping complex. November 21, 2017.